James Sanborn is noted for his work with American stone and related materials that evoke a sense of mystery and the forces of nature. He is probably best known for the Kryptos sculpture installed at Central Intelligence Agency headquarters in 1990, which displays encrypted messages that continue to stump code-breakers to this day. 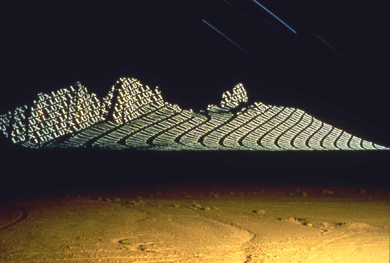 From his series of topographical projections, Sanborn created this piece at Blue Mesa, Utah in 1995. The repeated word "lux," Latin for "light" and also the International System unit of illumination, is projected onto the landscape. Sanborn has exhibited at the High Museum of Art, the Los Angeles County Museum of Art, the Corcoran Gallery of Art, and the Hirshhorn Museum and Sculpture Garden. He has been commissioned to create work for the Massachusetts Institute of Technology, the Central Intelligence Agency, and the National Oceanic and Atmospheric Administration. Sanborn was born in 1945 in Washington, D.C.